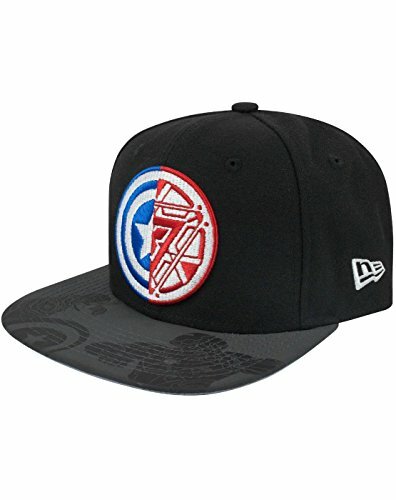 A stylish addition to any superhero fans look, this New Era 9FIFTY Captain America Civil War Logo Viza Print snapback cap is a premium product from one of the leading manufacturers in headwear. Inspired by the MCU film Captain America Civil War, this cap features a mash up of the two iconic symbols for Captain America and Iron Man together; Tony Stark's Arc Reactor acts as one half of the patch, while Captain America's iconic vibranium shield completes the icon. 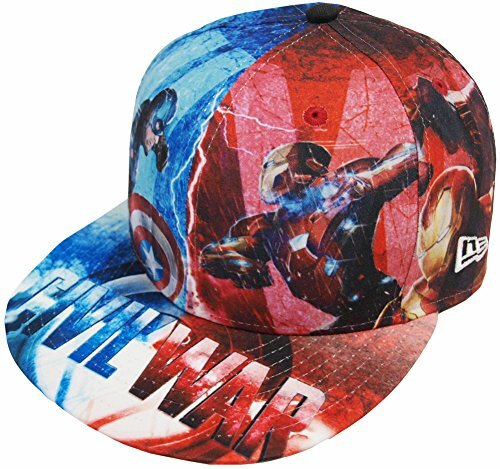 The visor of the cap also features awesome additional detail, with a print of the two iconic characters going toe-to-toe in battle. This 9FIFTY cap comes in black and also benefits from an interior branded taping as well as a COOLERA moisture wicking black sweatband. 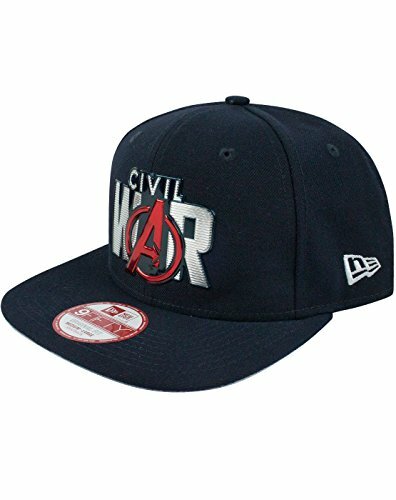 This Captain America Civil War Logo cap is an snapback cap and has an adjustable open back; please refer to the New Era size guide for all information about sizing. 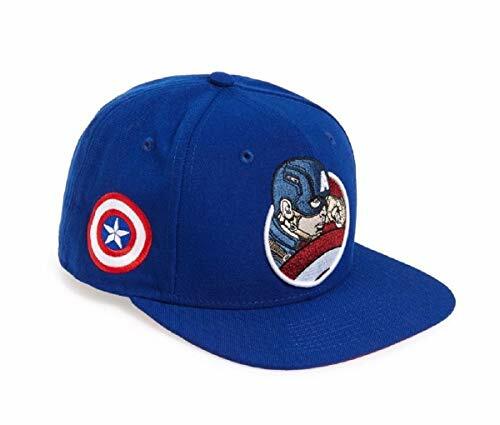 A stylish addition to any superhero fans look, this New Era 59FIFTY Captain America Civil War All Over cap is a premium product from one of the leading manufacturers in headwear. 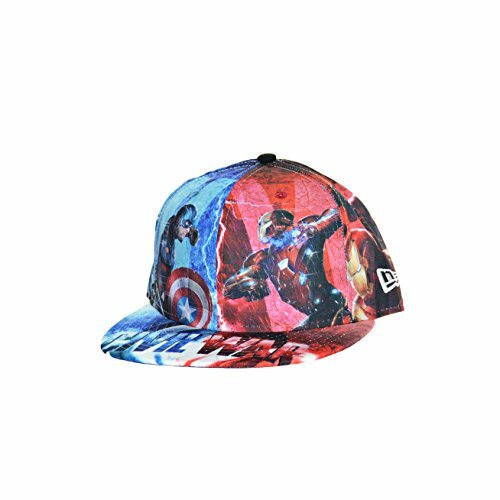 Inspired by the MCU film Captain America Civil War, this cap features an all over print in vivid colour and crisp detail, showcasing the two factions in the divisive superhero war; on the left side in blue, Captain America, and on the right in red, Iron Man. On the reverse of the cap, the films title is featured in a bold embroidered style. This 59FIFTY cap also benefits from an interior branded taping as well as a COOLERA moisture wicking black sweatband. 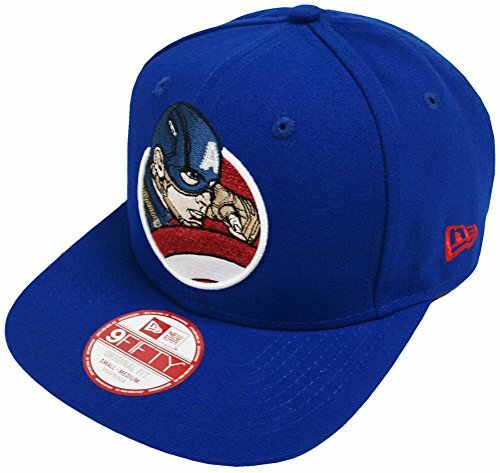 This Captain America Civil War all over cap is fitted and has a closed back; please refer to the New Era size guide for all information about sizing. 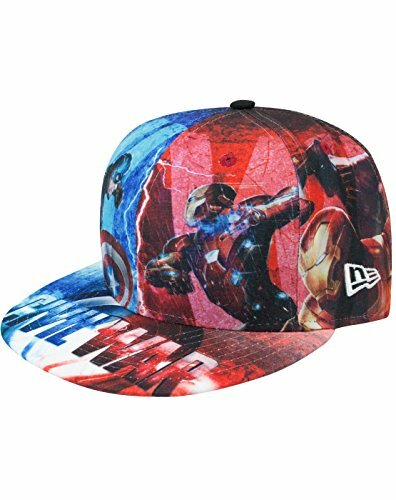 A stylish addition to any superhero fans look, this New Era 9FIFTY Captain America Civil War Liquid Chrome Logo snapback cap is a premium product from one of the leading manufacturers in headwear. Inspired by the MCU film Captain America Civil War, this cap features the films logo in a glossy styled patch across the front of the cap. This 9FIFTY cap comes in dark navy and also benefits from an interior branded taping as well as a COOLERA moisture wicking black sweatband. 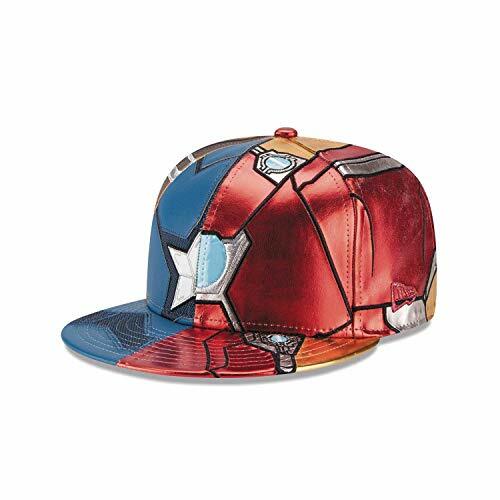 This Captain America Civil War Liquid Chrome logo cap is an snapback cap and has an adjustable open back; please refer to the New Era size guide for all information about sizing. Schöne Marvel Kappe von New Era. Fitted= Genähte Cap Hierbei bitte vor Kauf unbedingt Nachmessen: 6 7/8(54,9cm) 7 (55,8cm) 7 1/8(56,8cm) 7 1/4(57,7cm) 7 3/8(58,7cm) 7 1/2(59,6cm) 7 5/8(60,6cm) 7 3/4(61,5cm) 7 7/8(62,5cm) 8 (63,4cm) Über New Era: New Era Cap Company, Inc. wurde 1920 gegründet und ist der führende Hersteller von Headwear und New-Era-Kleidung. Das Unternehmen bringt Produkte auf den Markt, die über Zeit, Kultur, Sport und Mode hinausgehen. Mit einer Produktionsauflage von über 35 Millionen Kappen pro Jahr ist New Era der exklusive Hersteller und Lieferant der offiziellen Kappen, die von allen Teams der Major League Baseball und ihren Partnern in der Minor League getragen werden. Darüber hinaus bestehen Abkommen mit anderen Lizenzpartnern. Unter Kennern ist New Era für seinen charakteristischen Kappenstil 59FIFTY als „Originator of the True Fitted“ bekannt. Das Unternehmen hat seinen Hauptsitz in Buffalo, New York, und betreibt Werke in Alabama, Kanada, Europa, Japan und Hongkong. New Era Cap ist „teilnehmendes Unternehmen“ der Fair Labor Association. THIS HAT FEATURES A PU ARMOR STYLE HAT, SPLIT IN THE MIDDLE. ONE SIDE IS CAPTAIN AMERICA AND THE OTHER IRON MAN. PRINTED UNDERBRIM AND INNER LINING. THE "NE" FLAG SITS ON THE LEFT IN METALLIC RED AND THE AVENGERS LOGO ON THE RIGHT SIDE. Sehr schöne Marvel Snapback-Cap von New Era. Der Unterschirm ist rot. Snapback=Verstellbarer Verschluss hinten. Über New Era: New Era Cap Company, Inc. wurde 1920 gegründet und ist der führende Hersteller von Headwear und New-Era-Kleidung. Das Unternehmen bringt Produkte auf den Markt, die über Zeit, Kultur, Sport und Mode hinausgehen. Mit einer Produktionsauflage von über 35 Millionen Kappen pro Jahr ist New Era der exklusive Hersteller und Lieferant der offiziellen Kappen, die von allen Teams der Major League Baseball und ihren Partnern in der Minor League getragen werden. Darüber hinaus bestehen Abkommen mit anderen Lizenzpartnern. Unter Kennern ist New Era für seinen charakteristischen Kappenstil 59FIFTY als „Originator of the True Fitted“ bekannt. Das Unternehmen hat seinen Hauptsitz in Buffalo, New York, und betreibt Werke in Alabama, Kanada, Europa, Japan und Hongkong. New Era Cap ist „teilnehmendes Unternehmen“ der Fair Labor Association. 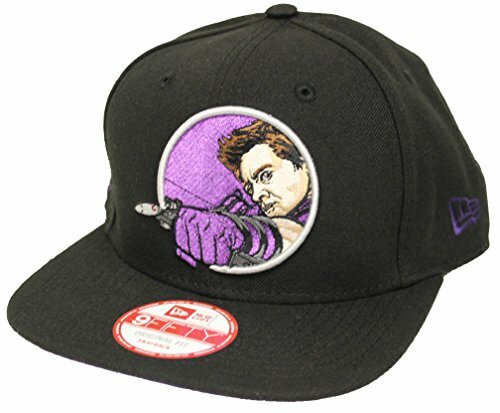 THIS HAT FEATURES HAWKEYE ON THE CENTER OF THE HAT IN 3D. THE SIGNATURE "NE" FLAG SITS ON THE LEFT IN PURPLE. ON THE RIGHT SITS THE HAWKEYE LOGO IN PURPLE & THE UNDERBRIM IS PURPLE.